In the same week that local gasoline prices mysteriously spiked up nine cents per liter, blamed on the weakening Canadian dollar, and a refinery fire in Los Angeles (of all places), the Wall Street Journal reported that the global oil glut has consumed more than 80% of the available storage capacity. The WSJ report went on to state that with production levels still not likely to decline, oil supply would continue to grow well beyond demand, driving prices into another sharp decline, perhaps as low at CitiBank‘s forecast of $20 per bbl. Now the International Energy Agency has corroborated the WSJ forecast with its own dire oil market forecast. Both do not see any early end in sight. Crude prices plunged Friday on this news, to below $45 per bbl. The benchmark U.S. oil price tumbled to a six-week low Friday, thwarting hopes for a sustained recovery after an influential energy watchdog said U.S. production growth is defying expectations and setting the stage for another bout of price weakness. Investors and oil producers should brace for further declines in oil prices, the International Energy Agency said in a monthly report. Prices haven’t fallen far enough yet to cut supply, and some signs of rising demand are just temporary—bargain buyers using cheap oil to fill up stockpiles, the agency said. That outlook weighed on sentiment in the oil-futures market, which has stabilized in recent weeks following a seven-month selloff that saw the benchmark price on the New York Mercantile Exchange plunge 59%. Behind the selloff, which by some measures was the steepest in decades, was a global glut of crude spurred by rising production in the U.S. and Libya. “This IEA report today confirmed a lot of things bears had been talking about,” said Todd Garner, who manages $100 million in energy commodity investments at hedge fund Protec Energy Partners LLC based in Boca Raton, Fla. “It is a big deal.” His fund is slowly adding to a bet the growing supply will keep bringing down gasoline futures, he said. The IEA’s report echoed growing concerns in the market that the amount of available oil storage is dwindling, which potentially could weigh further on prices if output continues unabated. Many barrels are building up in U.S. storage tanks and behind drilled but idled wells. That overhang can flood the market any time prices rise, acting as a cap on prices, Mr. Garner and others said. Light, sweet crude for April delivery fell $2.21, or 4.7%, to $44.84 a barrel on the New York Mercantile Exchange. The contract closed within 40 cents of the 6-year low closing price of $44.45 a barrel set on Jan. 28. Brent, the global benchmark, fell $2.41 a barrel, or 4.2%, to $54.67 a barrel on ICE Futures Europe. Both Brent and U.S. oil had their biggest one-day percentage losses in about two weeks. Oil prices fell sharply Friday. Late last year, workers on a Texas drilling rig grappled with equipment. Financial markets have been closely watching oil prices, which had recovered to more than $60 a barrel for Brent crude. 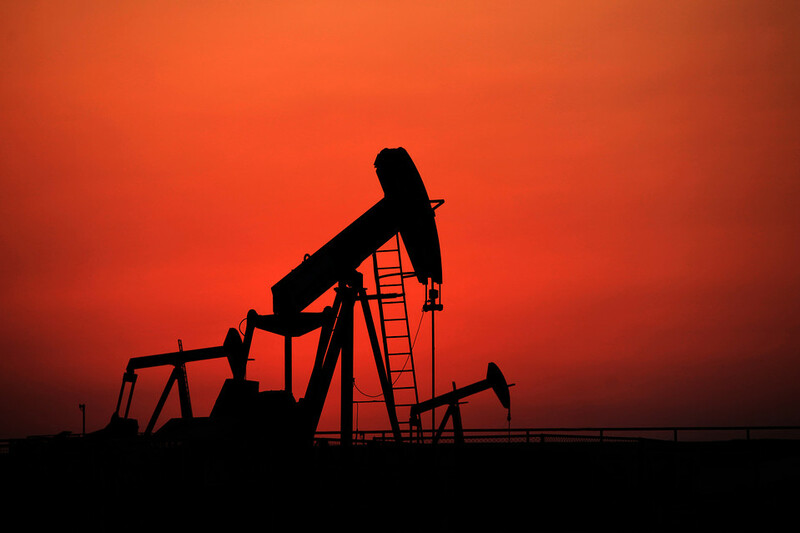 Oil prices had traded in a fairly narrow range for about a month, raising the question of whether the market had stabilized after a historic collapse. Rig counts, one closely watched metric, fell for a 14th straight week, Baker Hughes said Friday. The U.S. oil-rig count fell by 56 to 866 in the latest week. That is down 46% from a peak of 1,609 in October, but hasn’t led to a commensurate cut in production because producers are still completing previously drilled wells and focusing on the highest producing areas to trim costs. Rig counts in the country’s biggest three shale oil fields, the Bakken, Eagle Ford and Permian, haven’t fallen nearly as fast, according to Citigroup Inc.
Today’s oil industry compares to the natural-gas bust of 2011 and 2012 when a dramatic price collapse led to massive cuts in rig activity, but no slowdown production, the bank said in a note this week. Producers got more efficient and left a backlog of wells to connect later. Prices fell by half and took more than a year to fully rebound. Citi expects U.S. oil production this year to grow by 700,000 barrels in 2015 under almost any scenario, it said. “If you don’t complete wells now, that just means you have more later,” Citi analyst Anthony Yuen said. “When the price is supposed to get high, it will just get dampened” when the uncompleted wells get tapped. As oil prices consolidated in recent weeks, Mr. Rudderow bought options that would pay off if June futures fell back to a range between $43 and $50 a barrel, he said. He has about 15% of a $600 million fund on oil bets and might add to it if oil keeps falling, potentially setting off a panic, he added. Another oil-market contraction could spell good news for motorists, who had begun feeling rising crude prices in higher costs at the pump in the past two months. The average retail cost of a gallon of gasoline in the U.S. was $2.49 this week, compared with $2.04 on Jan. 26, according to the U.S. Energy Information Administration. Front-month gasoline futures closed down 2.6% to $1.7623 a gallon. Diesel futures closed down 3.7% to $1.7130 a gallon. Others on Friday echoed the IEA’s view, saying that, in the short term, the oil market is fundamentally weak. “U.S. production growth has not yet slowed enough to balance the oil market,” Goldman Sachs said in a note to investors. Investors did take heed in the week ended Tuesday, pulling back on a bullish bet on oil prices, according to the U.S. Commodity Futures Trading Commission. Hedge funds, pension funds and others added to their short positions, or bets on lower prices, by 4,763 and added to their long positions, or bets on rising prices, by just 731. It pulled back the net bullish position by 2.5% to 160,278.